For some time I have been concienciously writing out my "Hearts Desires" - in my case that is a small list of my goals and dreams, every morning, and amazingly (unlike me normally) I haven't missed a day yet. Lots of people suggest writing out a daily goals list including Brian Tracy because it's a great idea! Especially first thing in the morning. It sets a habit of focusing on your purpose, on the things you intend to achieve and keeps them in the forefront of your mind, making you are constantly on alert for opportunity. On a subconscious level your mind is perpetually working on it, even when you are engaged in other activities. The magical part of this is that often, people who engage in this practice claim they begin to become reality, without conscious effort! They simply "manifest" themselves into your life. 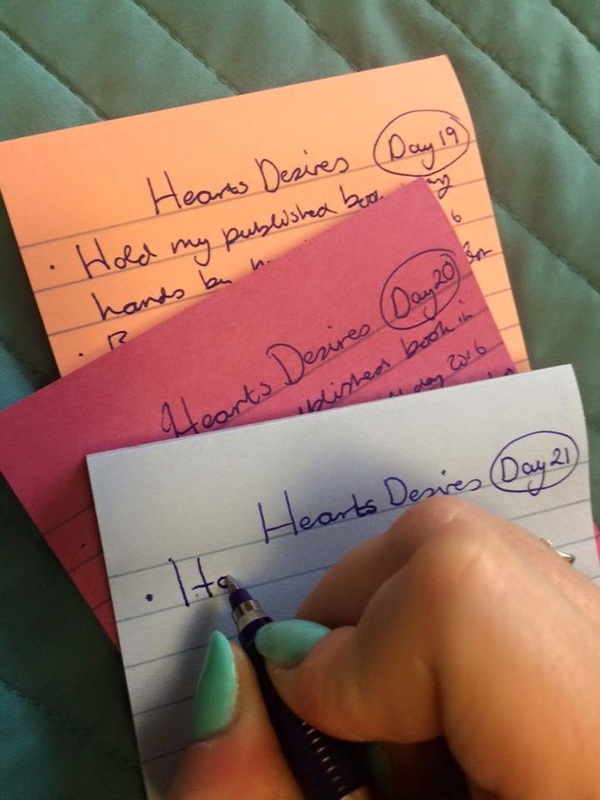 I challenge you to take "The 21 day Hearts Desires Challenge"
Write out your Hearts Desires - 8 to 12 of your most desired future achievements, by hand, every morning for 21 days in a row. It only takes about 4 minutes. If you forget a day, forgive yourself and start again from day 1 - keep going! The idea is, if you can sustain this effort for 21 days it will become a wonderful habit that will propel you forward into your goals, achieving more, faster and ultimately have a more fulfilling life! Set awesome intentions in this exercise! Things you truly, deeply desire! Things that make your heart swell! - own a "fresh" Bentley (I got that from "The Rock" by the way ;)) custom painted candy-apple red. If you don't know, or do but can't really remember how to set absolutely outstanding, self-motivating goals fill in the survey opposite and get my "Ultimate Goal Setting Guide" FREE! And WIN $1000 Hypnosis with Audrey! ​Please fill in our short survey to get my "Ultimate Goal Setting Guide" FREE so you can start making goals that almost achieve themselves! PLUS a chance to win $1000 of hypnosis with Audrey! Disclaimer: The term "Hypnosis" (sometimes referred to as a "Hypnotic state") is used throughout this site to describe natural brain activity that all humans experience from time to time. The effectiveness, depth of hypnosis and end results vary from person to person and cannot be firmly guaranteed. *All claims in testimonials and other parts of the site are there purely to provide an example of a particular individuals results, not as an expectation of everyones results. The winner of the $1000 of Hypnosis Draw is drawn at random when a sufficient number of entries (100) is received and will be informed immediately by e-mail, with full instructions how to claim.